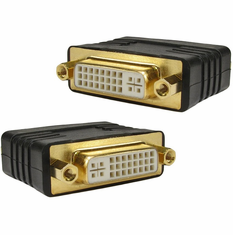 Because of the design, this will actually work with just about any type of DVI Cable. Great for taking your regular DVI Cable and making it an extension cable. Please keep in mind that, genereally speaking, extending standard 28 Gauge DVI Cables over 5 Meters is not recommened to ensure a good quality signal. Also note, that, although you "could" use this to join an HDMI to DVI-D and a VGA to DVI-A, you would NOT get a signal. I purchased this for technicians. So far, no problems.